Yangshuo, a county town 65 km south of Guilin city, is characterized by breathtaking landscape scenery, a holiday atmosphere, and rustic culture. The section of the Li River between Guilin and Yangshuo is the most attractive stretch, and there are several activities you can try in order to experience the local life and culture. Now, let’s find out what you can see and experience in Yangshuo. 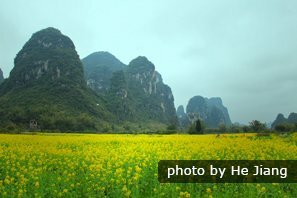 There is a saying that "the landscape of Guilin is the most beautiful in the world, but the landscape of Yangshuo is the most beautiful in Guilin". 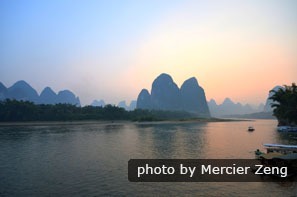 Yangshuo County has a good portion of the world&apos;s most impressive karst landscapes combining hills, rivers, and caves. There are plenty of places to explore and activities to do. 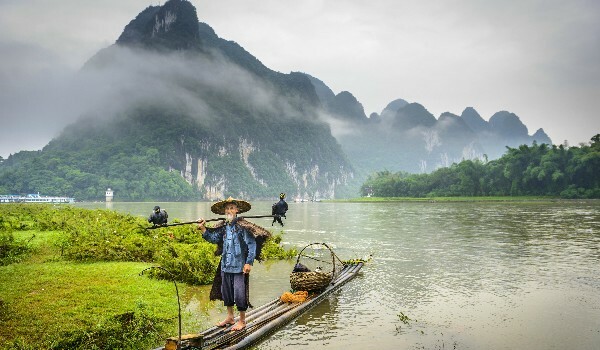 The karst landscapes are widespread in Yangshuo, forming numerous natural attractions, such as the Li River, the Yulong River, Nine Horses Fresco Hill, and Silver Cave. You can take a cruise along the Li River to see the landscape ‘painting scroll’ gradually unfold before your eyes, drift along the Yulong River on a raft to enjoy closer contact with nature, or visit some fantastic karst caves to admire the craftsmanship of nature. Discover all the information you want to know about the karst landscapes — the formation, the attractions, and how to visit the different areas. 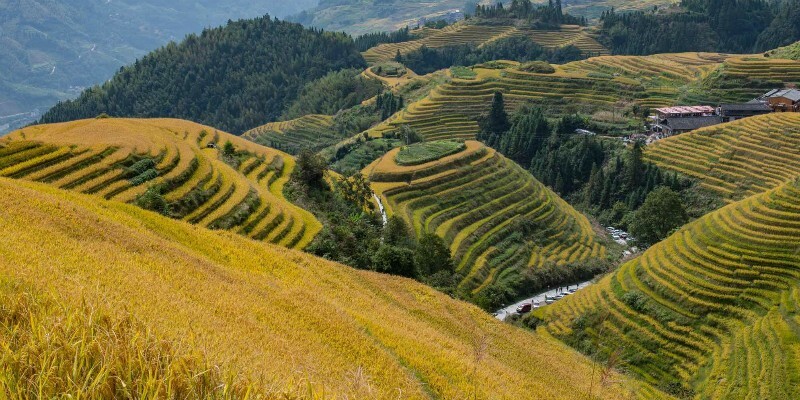 In this splendid setting are numerous Zhuang ethnic villages where the paddy fields are farmed and local traditional customs are continued. If you are a nature lover, taking an easy hike or going cycling on the countryside roads are good experiences. 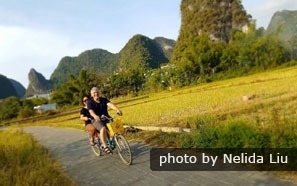 You may prefer to choose another kind of vehicle, which is much more popular with the locals — an electric bike. Your guide can give you some excellent ideas about hiking and cycling routes. While you enjoy the natural surroundings, you will also have the chance to go in the villages and learn about the local people’s daily lifestyles. 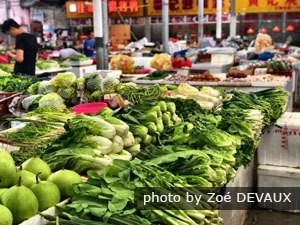 You can help them to do some farm work, such as planting or picking vegetables, making glutinous rice cake, or grinding tofu. If you are tired of walking, a local farmer may invite you to sit on his/her farm tractor and drive you around the village. The vehicle might be a little bumpy and noisy, but it is part of their daily life and is a good experience to try. 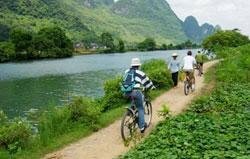 Read more about Yangshuo countryside cycling. Are you interested in becoming a Yangshuo citizen for one day? You can visit a local fair or food market with your guide, try bargaining with the vendors, and use your smartphone to make a payment. After you have bought the ingredients, you can join a cooking class to learn how to cook local dishes. After the class, you can say that you are a native Yangshuo person! There will be more things for you to experience too: fishing with a cormorant or osprey, learning tai chi, learning Chinese painting and calligraphy, and trying to make a folding fan. Your guide will help you with all these activities if you are interested in them. If your physical condition permits, why not try some cool outdoor activities? The karst landscape not only creates beautiful scenery but also provides sites for outdoor activities. You can experience rock climbing, spelunking, or camping. It is also possible to take a helicopter trip to admire the scenery from the sky. Tell your guide if you want a challenge. After a day of visiting attractions, it is good to spend some leisure time in West Street, which is filled with a combination of traditional Chinese culture (local architecture, souvenirs, snacks, restaurants…) and potent Western flavors (beer, coffee, steak, pizza…). Watching Impression Liu Sanjie (a musical ON the Li River about the ‘Zhuang song fairy’) is another option. Yangshuo has no airport but it does have a high-speed railway station and a bus station, which both connect to important cities nearby. You can take a high-speed or bullet train to Yangshuo directly without needing to transfer in Guilin, or you can take a bus from Guilin airport or railway station. Taking private transport with a local tour service or cruising along the Li River are also good options when traveling from Guilin to Yangshuo. Yangshuo Railway Station is an intermediate station of the Guiyang–Guangzhou high-speed railway, which connects some important cities, such as Shenzhen, Chengdu, and Chongqing. You can get to Yangshuo from downtown Guilin by taking a direct bus from the long-distance bus station, which is 700 meters north (10 minutes’ walk) of the main Guilin train station. The buses leave every 10 minutes or so and cost about 25 yuan (about 4 USD). You will arrive within 1½ hours. If you are going on your own, a lack of English signs and service could be a challenge. Taking a taxi from Guilin to Yangshuo is more comfortable but costs more. Also, you will face problems with the language barrier. If you choose to travel this way, you can inform your hotel in Guilin and let the staff write down all the information needed for you to show the taxi driver. The journey may cost 200 yuan and take 1½ hours. We provide comfortable transport from Guilin to Yangshuo with an English-speaking driver and a private car. This service is the best choice for overseas travelers. 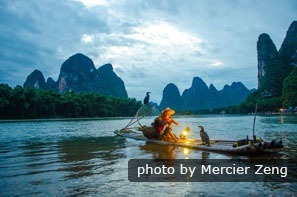 Read about Guilin and Yangshuo transportation. Being spicy and sour, Yangshuo dishes have flavors that are typical of south China. Some famous Guilin dishes are also enjoyed in Yangshuo. Located beside the Li River, fish is a must-eat dish on your Yangshuo menu. 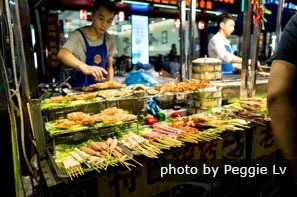 The most famous Yangshuo dish is beer fish. Just as its name implies, the chefs use beer to cook the fish in. The alcohol evaporates while cooking, so people who can&apos;t drink alcohol can also enjoy the dish. In West Street, you will have more choices of what to eat. Besides Chinese restaurants, it is possible to find restaurants serving Western food. There are also restaurants serving vegetarian, Indian, gluten-free, and Muslim food. Restaurants serving delicious dishes are sometimes hidden in the backstreets and can only be found by locals. You may tell your guide if you want to discover these tasty dishes. The dishes can be cooked with less seasonings according to your preferences, so remember to let your guide assist you when ordering the food. Do you dream of staying amid the scenery? If you do, Yangshuo is the place to realize your dream. Yangshuo has hotels nestling in the scenic area where you can enjoy all-round hillside or river views. Yangshuo also has hotels with distinctive characters. For example, a hotel that used to be a sugar mill, a hotel decorated in the style of an ancient garden, and a hotel with wooden architecture and bamboo furniture. 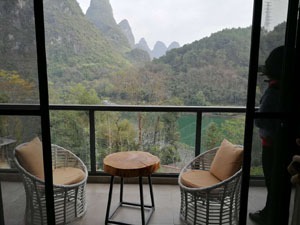 You may check our suggested outstanding Yangshuo hotels or inform us of your ideas about where you would like to stay. Spring is the warm and wet season. It is possible to view the beautiful misty scenery on the river. It is also a wonderful time for hiking or cycling in the countryside. Summer is hot with lots of rainfall and the rivers will flow more. The caves are pleasantly cool during summer. Autumn is usually drier and warm (but not hot). This time of year is suitable for sightseeing and outdoor activities. Winter can be freezing cold but is not the peak season. You may have the chance to experience Chinese New Year. 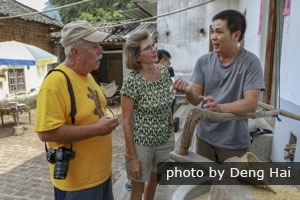 Traveling with a local guide in Yangshuo is a good choice as he/she will find you some impressive places to see or activities to do, help you to bargain when you want to buy something interesting, or tell you some stories about the attractions you are visiting. Your credit card may not work very well there so carry a sufficient amount of cash instead. Alternatively, use a more popular method: mobile payment. Your guide can help you to create your Alipay or WeChat account and then teach you how to use it for payments. You may want to bring some mosquito repellent (they don’t carry malaria but bites do itch), especially in summer, as it’s not so readily available in China. Bring long-sleeved clothing if you intend to visit e.g. Silver Cave as the temperature is lower inside. An umbrella/hat/sunscreen may be required, but is easily and cheaply bought in Yangshuo. Need an insider’s advice? China Highlights should be your top choice. Our headquarters is only 1½ hour’s drive from Yangshuo and no one knows Yangshuo better than us. Take a look at our sample itineraries below. They can be customized to your requirements. We are tour design experts. If you are interested in doing something quite different, you can just tell us your interests and requirements, and we will create a unique tour with you.